The year 2019 marks the 50th anniversary of the 1969 Santa Barbara oil spill. 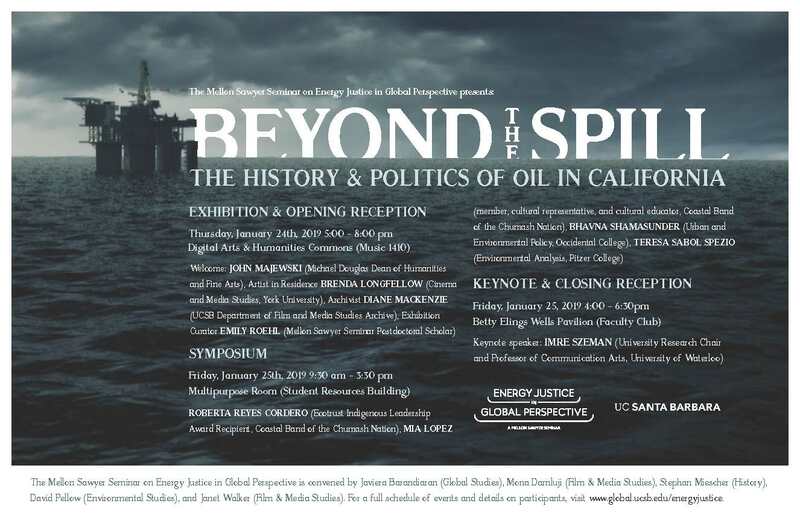 The Mellon Sawyer Seminar on Energy Justice in Global Perspective at UCSB is excited to invite you to our upcoming symposium, BEYOND THE SPILL: THE HISTORY AND POLITICS OF OIL IN CALIFORNIA, which will take place on January 24-25 at UCSB. Attached to this message you will find a poster that we would love for you to share with your colleagues, friends, and email lists. For a full schedule of symposium events and information on participants, please see our website at http://www.global.ucsb.edu/energyjustice/events.